Ready to take your gaming to the next level? RESPAWN has the perfect seating solution for the console gamer who craves an extra level of comfort. 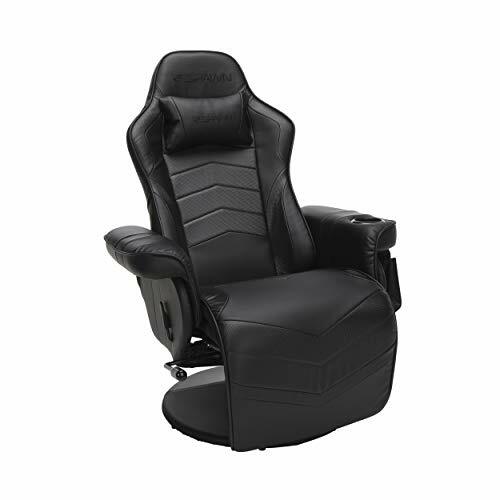 The respawn-900 racing style Gaming recliner, Reclining gaming chair, in Black, helps you win while relaxing in style. The gaming recliner features segmented padding that provides all-day Gaming comfort with a Headrest pillow to keep your spine aligned. There’s even a built-in cup holder, in the Left arm, to make hydrating easy and convenient and a removable side pouch to keep game controllers and Headphones at an arm’s length away. The chair and footrest are a continuous unit, which eliminates traditional recliner gaps for wires to get caught when you collapse the footrest. The back reclines independent From the extendible footrest, and vice versa, to provide freedom of choice in how you sit. The pedestal base provides sturdy support so you can recline and extend the footrest with confidence. The recliner swivels 360 degrees and holds users up to 275 lb. Sure, you can level up without this comfy Gaming recliner, but why would you want to? Rest comfortably, and assured, because the chair is covered by the RESPAWN limited lifetime . Game on! CONSOLE GAMING COMFORT provided by a plush removable headrest pillow and segmented padding that lead to the ultimate experience — a fully functional gaming recliner that lets you level up while laying back. CONTROLS AND DRINKS AT THE READY with a removable side pouch that hangs off the left arm to keep game controllers close and a cupholder built into the left arm so you don’t have to pause the gaming action to refuel. CONTINUOUS SURFACE WITH INDEPENDENT CONTROLS. The chair and footrest are a continuous surface, no open spaces to get wires caught, but operate independently to give you total control over your gaming chair experience. RECLINE WITH CONFIDENCE. Comfortably recline up to 135-degrees and feel secure because the 360-degree swivel base provides sturdy support for both the extendable footrest and reclining back — allowing you to focus on your foes, not your balance. RESPAWN LIMITED LIFETIME WARRANTY covers your gaming chair for users up to 275 lb and has your back so that you can crush it on the battlefield.